Diamond Wire Sawing is the fastest and most versatile means of cutting heavily reinforced concrete. - Other materials used in construction. 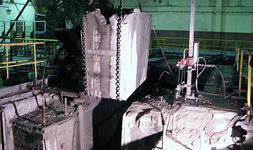 - Cutting of reinforced concrete under water. - Wet or dry cutting.